The Placer County Conservation Program (PCCP) will protect, enhance and restore certain special-status species and natural communities in western Placer County while streamlining state and federal permitting for covered development activities. The PCCP was prepared by the local agencies that will become permittees -- Placer County, the City of Lincoln, the Placer County Water Agency and the South Placer Regional Transportation Authority -- in cooperation with state and federal regulatory agencies. The local agency Permittees will form the Placer Conservation Authority (PCA) as a joint exercise of powers agency to oversee implementation of the PCCP. Western Placer County Habitat Conservation Plan and Natural Community Conservation Plan (HCP/NCCP or “Plan”) will protect fish and wildlife and their habitats and fulfill the requirements of the federal Endangered Species Act (ESA), and the California Natural Community and Conservation Planning Act (NCCP Act). Western Placer County Aquatic Resources Program (CARP) will protect streams, wetlands, and other water resources and fulfill the requirements of the federal Clean Water Act (CWA) and analogous state laws and regulations. In-Lieu Fee Program allows requirements under Section 404 of the Clean Water Act to be fulfilled by payment of a fee for compensatory mitigation of impacts on aquatic resources from activities covered under the HCP/NCCP and the CARP. The state and federal endangered species laws prohibit “take” of protected species without a permit. Take is broadly defined to include harm and habitat loss. The PCCP permits allow “incidental take” of species. The PCCP does not provide compliance under the Clean Water Act, but permits issued by the U.S. Army Corps of Engineers will streamline future compliance under the Clean Water Act. 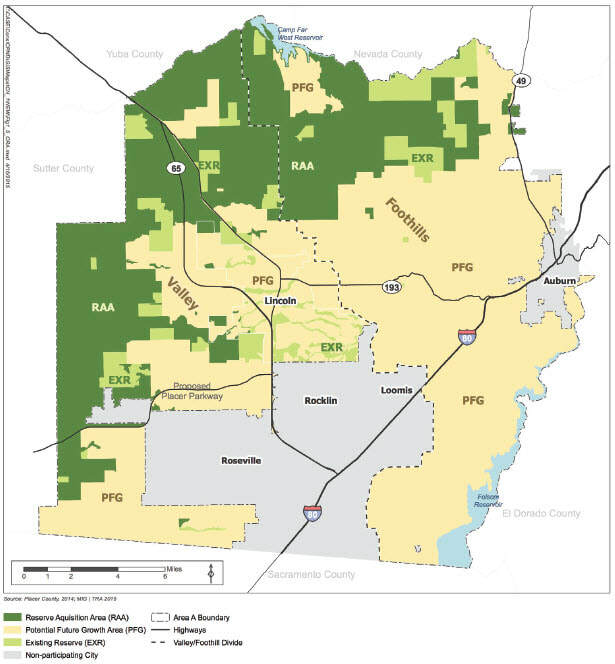 The PCCP Plan Area includes western Placer County and specific conservation activity areas in neighboring Sutter County. The Plan Area is where the permits will apply. The changing landscape of agriculture, urban development, and woodland across Western Placer County marks the transition from the Sacramento Valley on the west to the Sierra Nevada foothills on the east. The PCCP uses the natural break roughly along the 200-foot contour separating the valley and foothills as a way of organizing the plan. 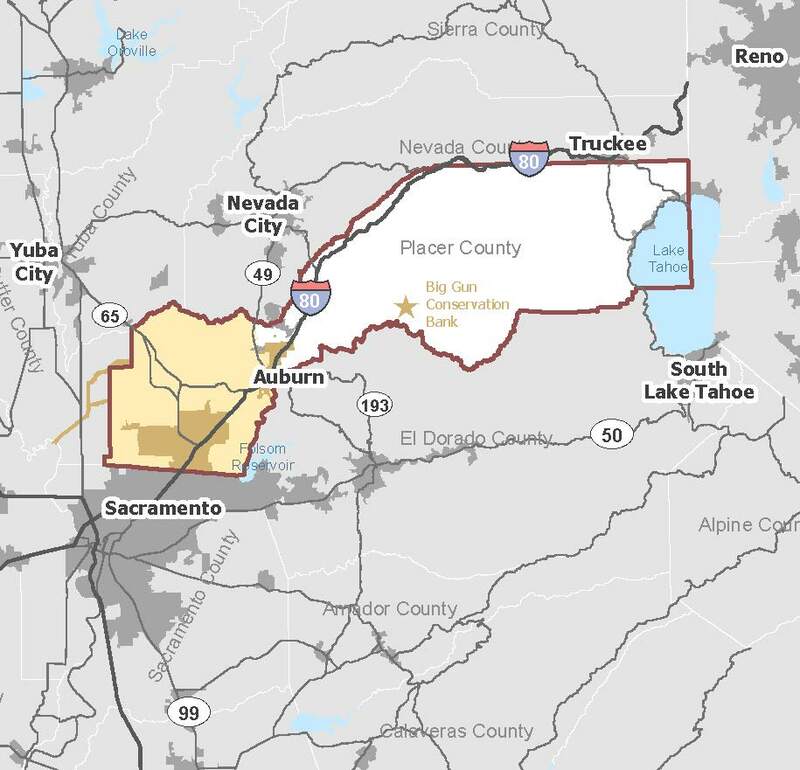 The Plan Area includes approximately 200,000 acres in Western Placer County ranging from State Route 49 westward to Sutter and Sacramento Counties, including the City of Lincoln and unincorporated Placer County. The cities of Auburn, Loomis, Rocklin and Roseville are not in the Plan Area. Lincoln and Placer County, with jurisdiction over unincorporated lands, are the two general land use authorities permitted under the PCCP. Plan Area A is the main focus of the HCP/NCCP and where all future growth and most of the Covered Activities will take place. Plan Area A is the city of Lincoln plus all unincorporated lands within western Placer County: approximately 209,800 acres, or roughly five sixths of western Placer County. Plan Area B comprises several specific additional areas in Placer County and adjacent Sutter County where only specific Covered Activities may occur. ​The PCCP was prepared by the local agencies that will become permittees -- Placer County, City of Lincoln, Placer County Water Agency and South Placer Regional Transportation Authority -- in cooperation with state and federal regulatory agencies. The local agency permittees will form the Placer Conservation Authority (PCA) as a joint exercise of powers agency to oversee implementation of the Plan. The permits cover activities that will be undertaken by or approved by the permittees. Most significant is the private development and public infrastructure for urban, suburban, and rural residential development to accommodate population and employment growth in the City of Lincoln and in unincorporated western Placer County over the next 50 years. Other permittees have specific public works projects that will be covered: South Placer Regional Transportation Authority for the Placer Parkway project running west from Highway 65 to Sacramento County and the Placer County Water Agency for construction/operations of new and existing water transmission facilities in western Placer County. The strong growth of the past few decades is expected to continue and the population of western Placer as a whole is expected to roughly double by 2065. The estimate of 50-year covered growth is based on a scenario derived from City and County General Plans, regional demographic projections, and an analysis of existing patterns of built-up and open land. In 2014 there were 109,000 people living in 40,000 households and 33,000 jobs in Lincoln and unincorporated western Placer County; the growth scenario shows an increase of 93,000 housing units and 91,000 jobs on roughly 30,000 acres of land. The PCCP minimizes and mitigates the impacts of that growth on covered natural communities and Covered Species.